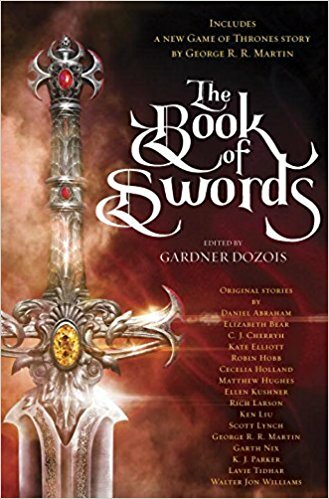 Today is the day: publication day for THE BOOK OF SWORDS, the mammoth new sword & sorcery anthology edited by my old friend (and sometime partner in crime) Gardner Dozois. There's an impressive table of contents, including brand new stories by giants of the genre like Robin Hobb, Ken Liu, the criminally underrated Matthew Hughes, Scott Lynch, Daniel Abraham, Cecelia Holland, Lavie Tidhar, and many more. Including yours truly. I'm here too, with "Sons of the Dragon," another installment in the Fake History of Westeros, this one chronicling the reigns of Aegon the Conquerer's two sons, Aenys and Maegor. Not a conventional story, no, more in the vein of "The Princess and the Queen" and "The Rogue Prince," but perhaps of some interest to those fascinated by the blood-soaked annals of the Seven Kingdoms of Westeros. THE BOOK OF SWORDS should be available today at your local bookstore or favorite online bookseller.